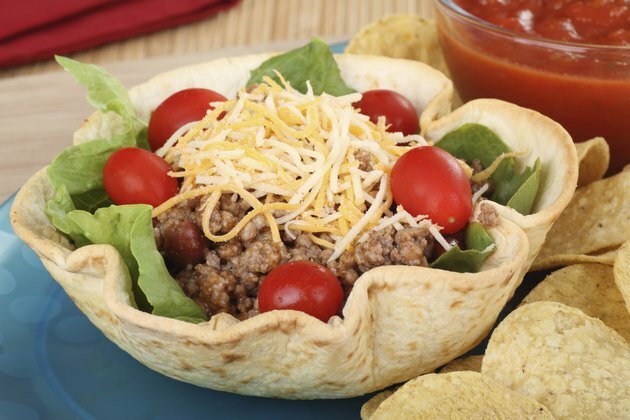 Taco salads are often served in crispy fried tortilla bowls and loaded with tasty toppings, including meat, cheese and sour cream. Unfortunately, this salad can end up being very high in calories and fat. Watch your serving size and request to limit certain ingredients to keep the calorie content of a taco salad under control. A whole fast food taco salad can contain as many as 906 calories and 49 grams of fat, or 75 percent of the daily value for fat. Eating just a 1 1/2-cup portion of the salad is one way to limit calories, as this portion contains less than 300 and about 13 grams of fat. Another option is to order your salad without the crispy taco shell, sour cream and cheese, for a salad that is about about 330 calories.